This blog post describes the exploitation of Xen Security Advisory 105 (XSA-105)  (CVE-2014-7155). This post explains the environment setup and shows the development of a fully working exploit on Linux 4.4.5. We are not aware of any public exploit for this vulnerability, although Andrei Lutas wrote excellent articles    describing the root cause of the vulnerability and how to trigger it. This post explains the environment setup and shows the development of a fully working exploit on Linux 4.4.5 (it probably works with many others versions). Xen versions from at least 3.2.x were vulnerable. We chose to exploit the XSA-105 on the last non patched version: 4.1.6.1. The vulnerability allows privilege escalation on Hardware Virtualized Machines (HVM ). According to Xen terminology, HVM guests are fully virtualized guests using virtualization extensions such as Intel VT or AMD-V. The other main type of Xen guest are paravirtualized (PV). Basically, the kernel detects Xen at boot time if it runs under an hypervisor, and uses paravirtualization extensions called pvops  in this case to be more efficient. Because the default compilation options of the Linux kernel enable pvops, we compiled a custom kernel with these extensions disabled. Dom0   is the initial virtual machine launched by Xen on boot. This is the most privileged guest and allows Xen administration. We chose to install Dom0 as a classical Debian 7.9.0. The second step requires the creation of an HVM guest. As the pvops are enabled by default, most Linux distributions should be in fact paravirtualized. We chose to use an Archlinux base installation  as HVM guest. The compilation option to deactivate the pvops is simply in Processor type and features -> Linux guest support (CONFIG_HYPERVISOR_GUEST=n). 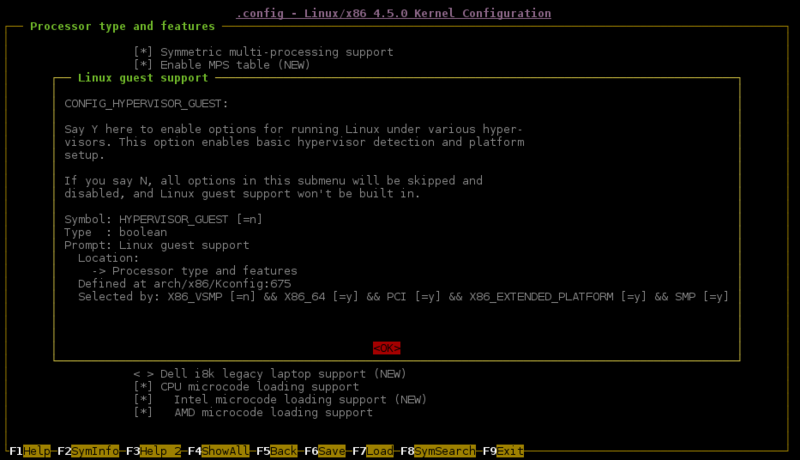 The xl configuration file used to launch the HVM DomU is straightforward. Let's take an HVM guest with 2 CPUs or more (since it's required for the exploitation of the vulnerability). In our case, the guest is loaded from a qcow image which has been directly created on a physical machine for better performances. The network interface is a bridge with the hypervisor network, which allows us to communicate with the guest through SSH. these instructions are not usually emulated, it means that we have to find a way to emulate them. The third proposition of the advisory seems to be the easiest to implement and this is the solution adopted by Andrei Lutas . Lutas has already provided a remarkable job explaining the vulnerable code in his paper , if you need explanations about those, definitely read his paper. Among the vulnerable instructions, only two of them could lead to a potential privilege escalation: lgdt and lidt. They respectively allow to change the value of the Global Descriptor Table Register and Interrupt Descriptor Table Register. 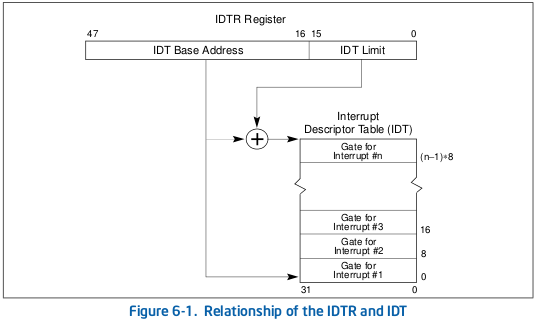 Both GDTR and IDTR have the same format: the upper bits contain the base address and the lower bits define the limit . 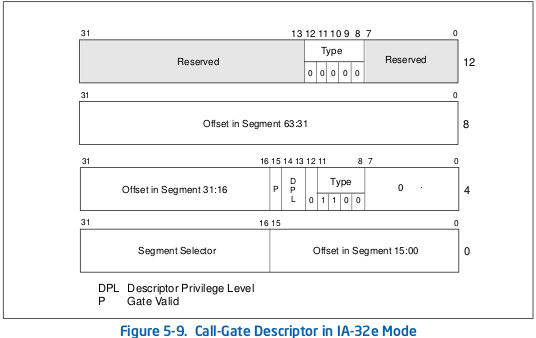 These values define the Global Descriptor Table (GDT) and the Interrupt Descriptor Table (IDT) addresses. According to Intel manuals, a non privileged code is not allowed to execute these instructions. If a user is able to load his own GDT or IDT, this can lead to an arbitrary code execution and a privilege escalation. Let's see how. The IDT is the x86 interrupt vector table . It is a basic table that associates an interrupt number with an interrupt handler. The entry number determines the interrupt number and each entry contains some fields such as: a type, a segment selector, an offset, a privilege level, etc. The interrupt handler address is determined by adding the segment base (determined with the segment selector) and the offset. If a user is able to load his own IDT, he can specify a malicious entry which links an interrupt to his own handler using kernel code segment selector. In order to avoid stability issues, the interrupt must be fowarded to the original handler. This can be done because the handler runs in kernel space, and it can read entries from the previous IDT. This IDT must have been previously saved using the sidt instruction because it must be restored before returning to user space. However, we have not tested it. We chose to use the GDT approach, despite the IDT solution adopted by Andrei Lutas . The current memory segments are specified in the segment registers. There are several segment registers: code selector, stack selector, data selector, etc. Each segment selector is 16-bit long. Bits 3 through 15 are an index in the GDT, bit 2 is the LDT/GDT selector, bit 0 and 1 are the Requested Segment Privilege (RPL). 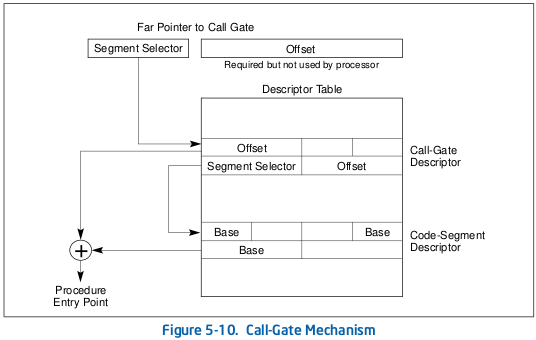 To access a call gate, the user has to perform a far call. The far call must specify the call selector. This selector has exactly the same format as any selector (index in the GDT, LDT/GDT selector, requested privilege). Then the CPU takes the segment selector specified in the call gate entry, takes the base of this segment, add the call gate offset and reaches procedure entry point. The far call routine first reloads the old GDTR and then performs a simple commit_creds(prepare_kernel_cred(0));. This routine must perform a swapgs before calling any kernel function and before returning to user space. Exiting the far call routine is done with a retf instruction. A demonstration is available here: asciinema, and the full exploit can be downloaded here: xsa105_exploit.tar.gz. This vulnerability allows a privilege escalation on a HVM guest with more than one CPU. We use the call gate mechanism in order to execute arbitrary code while Andrei Lutas  exploited an interrupt handler. Since it's just a PoC, some requirements must be met. SMEP shouldn't be enabled in the guest because the call gate handler is in user memory space. Also, the payload calls commit_creds(prepare_kernel_cred(0)); to gain root privileges. If kptr_restrict, we will not be able to retrieve the functions' addresses through /proc/kallsyms. A future blog post will talk about a guest-to-host escape, with a working exploit. Stay tuned!